The Tahina palm (Tahina spectabilis) is a fan palm found only in a remote part of Analalava district, north west Madagascar. The species has attracted a lot of attention from the scientific community in the nine years since it was first discovered. The palm was discovered by a cashew nut farmer, who identified the species as unusual in relation to any other type he had seen before. This was soon confirmed by the international plant community in 2006 and research has been conducted on the species ever since. With an initial known population of just 30 trees, the palm, as the sole member of its genus, was confirmed as a unique. Its closest relations were the small Chuniophoeniceae family found mainly in Asia. Recent research has suggested that Tahina spectabilis is in fact a member of the Chuniophoeniceae family under the sub family Coryphoideae. The Tahina palm is an incredibly tall tree, its trunk reaches up to 18m and can has a diameter of up to 50cm. In addition to its height, the palms leaf sheath can reach 110x58cm; this huge combined size means that the palm can be seen from aerial images on Google Maps. The species grows at the foot of limestone hills, in an area that is very arid during the dry season but floods during the rainy season. It is suspected that the species was once abundant in wetland habitats but due to the reduction of the habitat and an increase in wild fires, the species has retreated into the shadow of the limestone mountain for protection. The palm is particularly unique due its dramatic, ‘hapaxanthic’ flowering sequence; this means the species only flowers once in its lifetime, between the ages of 30 and 50, when it produces a large additional stem that branches into clusters of flowers. 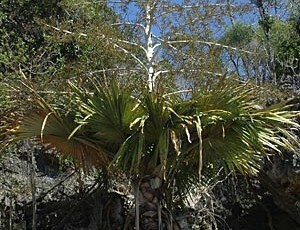 This habit has earned the species its other common name of the ‘suicide palm’. Flowering occurs in September during Madagascar’s dry season. Despite being only recently discovered, the species is listed as Critically Endangered. The main issues facing Tahina spectabilis are its small and isolated population, loss of habitat, and grazing by livestock and other organisms. Climate change could also be another factor threatening this species. Due to its interesting history, Tahina spectabilis has been listed in the press making The World’s 100 Most Threatened Species (and one of the Top 10 new species back in 2008). The hope is that this publicity will contribute to protecting the species in the future. Action has already been taken by Kew Madagascar who have lead seed collection efforts in order to grow the species both within the current site, Madagascar and internationally and currently the species is held in 20 ex-situ collections. In 2017, an expedition by Kew Madagascar found a new population of 27 individuals, therefore the future for Tahina spectabilis is a hopeful one. Dransfield, J., Rakotoarinivo, M., Baker, W.J., Bayton, R.P., Fisher, J.B., Horn, J.W., Leroy, B. & Metz, X., 2008. A new coryphoid palm genus from Madagascar. Botanical Journal of the Linnean Society, 156 (1), pp. 79-81. James, H.E., Rakotoarinivo, M., Baker, W.J., Dransfield, J. & Shapcott, A., 2010. The Conservation Genetics and Demography of Tahina spectabilis a Recently Discovered Monospecific Palm Genus from Madagascar. 2010 International meeting of (ATBC), Bali, Indonesia, 19-23 July 2010. Roasted seeds from the Critically Endangered Paraná pine are a popular winter snack in Southern Brazil.